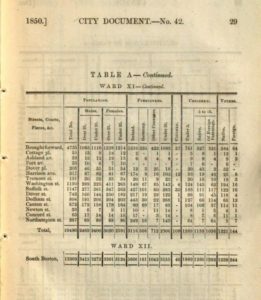 The Early Black Boston Digital Almanac project models an approach for collecting and contextualizing archival materials to address a gap in many common narratives of Boston’s past—the contributions of black individuals to the city’s history—in a digital almanac format. With the EBBDA as an example, the BRC will consider approaches to handling both perceived and actual absences in historical records, while exploring new methods for representing race in historical data collections. In the BRC prototyping phase, the project teams has investigated ways that maps and visualizations might show large-scale historical trends while further contextualizing the archival items curated by the EBBDA. 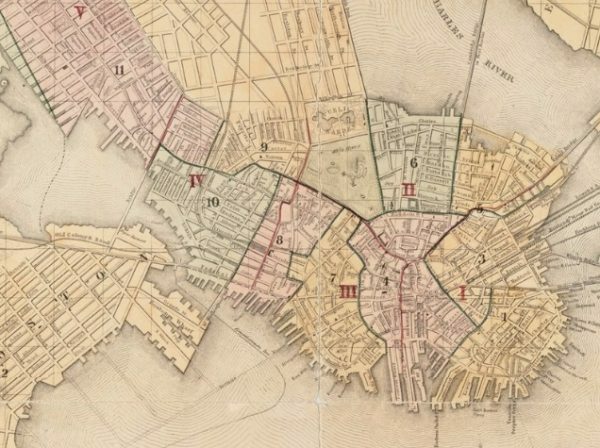 The EBBDA and BRC will soon publish prototype interactive maps showing information on Boston’s 1850 wards and census data; for more details on this project, see here. Read more about the pilot processes and outcomes here and see an early prototype map here. This project, based in Northeastern’s English Department, brings together faculty, graduate, and undergraduate students with members of the broader community to publish digital exhibits related to black individuals in Boston. The EBBDA exhibits, published through the Digital Scholarship Group’s CERES Publisher, include maps and timelines that contextualize and connect archival objects from the seventeenth through the early nineteenth centuries. The site is dedicated to exposing the movements, places, art, and spoken words of black individuals that have shaped Boston over the years, encouraging viewers to learn more about the various positions of black figures in Boston’s history and the larger social impacts that black individuals have had, and still have, on Boston. The EBBDA has already built several exhibits and developed spaces for community and classroom involvement. For the BRC’s prototyipng over the summer and fall of 2018, the EBBDA worked with data visualization and GIS specialists in the Digital Scholarship Group to bring together census data and historical maps related to an exhibit on jobs and African American populations in nineteenth-century Boston. For more details on this project, please see here. This project demonstrates that the intersection of maps and data can yield constructive new histories beyond what is offered by each in isolation, providing rich ways of visualizing different types of data and addressing absences in historical data.